So 2008 is drawing to a close and tomorrow it will be 2009. As I look back on the past year, I look back on a year that was filled with success. I have continued improving on various fronts, as I have for each year that I have run. Hopefully this will continue in 2009, although as I get older I am sure that one year the improvements will disappear. As it is though, I still feel good and adding different goals other than PB's seems to help keep the interest at a peak. Another thing that keeps the interest going is the potential to travel. Each year I look at races all over, mostly in the US, and this list of places I want to race/visit seems to get longer. 2008 saw me eclipse the 3 hour marathon mark for the first time in Indianapolis, so that will always be a memorable race, but it was a great event regardless of how I did. I also ran 4 marathons this year, another first. Throw into that mix 4 50k ultras (Including the insane Jay Marathon), and my first 50 mile race (JFK)I would say it has been a very successful year. In total I have run 3220 km's and run for 261.5 hours. More distance than I have ever done in one year. I think I have gotten by rather well with only a few minor injuries etc. so hopefully that will continue. So what does 2009 hold for me? A lot of uncertainty. I have toyed with the idea of doing a hundred miler, although I'm not sure I'm ready for that. I hope to try at least another 50 miler this year, more trail runs/races, more travelling, more marathons, maybe more PB's. It would be nice to do another race like Jay again, that was a blast. Maybe Dances with Dirt. Anyway, hope anyone who might read this has a great and happy new year. Happy trails! At least it is actually winter now. so that we can legitimately complain about what a crappy winter we are having. 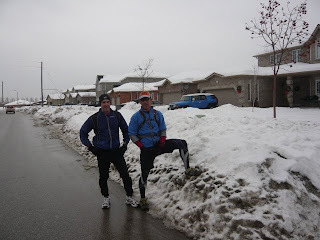 This weekend was another round of lousy running conditions. Fridays snow saw us get sent home from work early. That hasn't happened to me since the early 80's. So I went home thinking that running was out of the question and began to clear out the drive way. By the time I was done the sun was trying to come out, so I'm thinking maybe I could get out for a run, although the conditions wouldn't be ideal. I got changed and just before heading out the door Kevin mentioned Roger called to say he wouldn't be there. So as he would be the only one (other than me) to be foolish enough to go out in this, I decided not to go. As it turned out Theo and Hellaina both showed up. Saturday the Sun was out and I took advantage of it and ran 20k, it wasn't the best, but it would turn out to be better than Sunday. That night Victoria arrived home from England for the holidays, after a long, long series of flights, delays etc. Sunday I ran from home, met everyone at the RR and then ran home. The roads were slippery, snow covered, it was cold and windy. Just plain terrible. Although on the way home the sun came out and it actually got to warm. More snow today, more snow forecast for tomorrow and the day after... And it's not even January yet. This is going to be a long hard winter. I had a decision to make last night, run in the cold or wimp out and bore myself to death on the treadmill. Luckily I decided on the outside run, as it wasn't that bad. At least the roads were dry, it was cold, but manageable. Overall a decent run. 16.55k. While sit here and wait for winter to end before it has even begun, I am trying to figure how to get the resolve to do the long runs needed to properly train for the Ghost Town 38.5 race in January. Although it hasn't been long since JFK I still need to get the distance in and the weather hasn't been co-operating. Hopefully this weekend I can get in the double long runs in I want to. 19k+ on Saturday and 30k+ on Sunday. After last Wednesday's run I was a little concerned as both knees were showing signs of fatigue and I was afraid that I might do some damage. 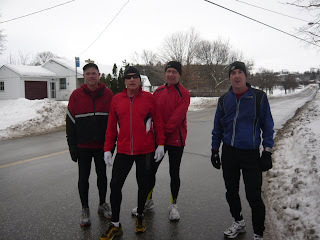 Friday nights run with Roger and Theo was good, but still a little pain the right knee, otherwise felt good. So going into Saturday's run I was a little apprehensive. I decided to run out Ardagh to Hwy 27, to 90 then up to Edgehill and then up the Ferndale Hill by the dump. I have to start getting some hill work in, so no time like the present. As it turned out I felt great, it was a bit breezy so I dressed warmer than I should have as once I ran with the wind at my back I got too warm. The Ferndale hill was no problem and after that it was just a matter of how far will I go. Once I came down the hill at Sunnidale I decided that it was time to head back, the knees were starting to feel it. Ended up with 19k and finished feeling good. After refueling, I went to Costco and bought a 32inch TV for the living room and spent the next couple of hours setting up . Saturday night was the Costco Xmas party and wouldn't you know it, we won a 32inch Samsung TV. So Sunday I spent unhooking the one I bought and took it back.